Parents of children with Autism Spectrum Disorder (ASD), a life-long developmental disorder, responded to an online survey considering their stress experience, affective symptoms and marital satisfaction. As these parents sourced different programs for their children, type of program was used to assign parents to different groups in order to consider their stress, affective symptoms and marital satisfaction. The type of programs parents used included the Applied Behaviour Analysis (n=15); Early Intervention Centre (n=13) and no formal program (n=16). 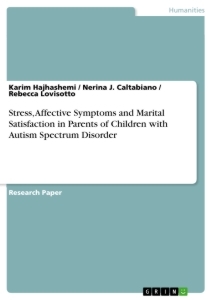 Parents of children with ASD in the ABA group reported significantly lower parental stress scores, lower affective symptoms scores and higher marital satisfaction scores compared to the other two groups. These results are suggestive of the beneficial effect that an ABA program can have on the family unit. Autism Spectrum Disorder (ASD) is characterised by qualitative impairments in social and communication behaviour, and a restricted range of activities. With the prevalence of ASD on the rise, the impact this disorder has on the family is worthy of investigation particularly as the stay-at-home mum that could have devoted time and effort to care for the child is a less likely occurrence. Management of ASD is regarded as highly crucial in relation to the developmental process of ASD children. Research (Corsello, 2005; Harris & Handleman, 2000) has found that children who are diagnosed as young as two and start a management program at diagnosis, are more likely to gain greater benefits from a program than children diagnosed at later ages. Other research (Grindle, Kovshoff, Hastings, & Remington, 2009; Osborne, McHugh, Saunders, & Reed, 2008; Remington et al., 2007; Roberts et al., 2011) has considered different program types with some giving more positive outcomes than others. In particular, programs based on the principles of Applied Behaviour Analysis (ABA) have shown optimistic results for children with ASD compared to others. The choices parents make for how they manage their ASD child can have impacts on their personal wellbeing. In this study we focus on those parents who have used an ABA program, and early intervention centre and those that have not considered any formal program. Programs based on ABA are highly intensive and involve up to 40 hours of intervention each week. Many studies (Ben-Itzchak & Zachor, 2007; Najdowski, Gould, Lanagan, & Bishop, 2014; Remington et al., 2007) have indicated that ABA programs efficiently remediate the intellectual, linguistic and adaptive deficits associated with ASD. Early Intervention Centres (EIC) are better viewed as an alternate to day care centres or preschools (McGee, Morrier, & Daly, 1999). They cater for children within a limited age range of four to seven years of age. EIC programs only offer 10 to 15 hours each week. EICs only show an increase in development for children who are 4-5 years old (Luiselli, Cannon, Ellis, & Sisson, 2000). To date research has mainly focused on parental stress and wellbeing of parents who have a child with ASD. One Australian study that has considered the association between intervention programs and parental variables is the work by Roberts et al. (2011). Their randomised controlled trial did not find group differences in parental stress between ABA interventions and wait-list conditions. Other empirical articles show that parents of ASD children have higher levels of parental stress and higher affective symptoms when compared to parents of typically developing children or children with other disabilities (Brobst, Clopton, & Hendrick, 2009; Dumas, Wolf, Fisman, & Culligan, 1991; Miranda, Tárraga, Fernández, Colomer, & Pastor, 2015). These elevated stress levels have also been reported across cultures. For example, Mori, Ujiie, Smith, and Howlin (2009) reported elevated stress levels in a sample of Japanese parents and Koegel et al. (1992) reported elevated stress levels in a sample of German parents. These stress levels were in comparison to both parents of typically developing children or children with other disabilities (Koegel et al., 1992; Mori et al., 2009). The increases in parental stress have also been reported despite methodologies or measurement tools used. For example, Koegel et al. (1992) used measurement tools designed for children with disabilities and Dumas et al. (1991) used measurement tools designed for general populations. Both studies concluded with similar results highlighting the increase in parental stress of parents with ASD children. Nevertheless some studies (i.e., Nachshen, Garcin, & Minnes, 2005; Sharpley, Bitsika, & Efremidis, 1997) have found the contrary. Sharpley, Bitsika and Efremidis (1997) noted that 20 percent of the sample did not perceive or report the situation to be comparably stressful. However, it could be argued that the research failed to accommodate the variance in diagnosis (Nachshen et al., 2005). Mori et al. (2009) found that parents whose child fell on the high end of the ASD spectrum show significantly lower stress levels compared to parents whose child fell on the low end of the spectrum. In brief, parents who reported no increase in parental stress may have had a child who was at the high functioning end of the ASD spectrum. However, despite these findings, the majority of empirical outcomes indicate that parents of ASD children do show an increase in parental stress. In an attempt to explain these increased parental stress levels the Family Adjustment and Adaptation Response Model (FAAR model) can be used (Patterson, 2002). The FAAR model, which extends from the Family Stress Theory, breaks down increased parental stress into three levels(Patterson & Garwick, 1994). The first level, situational meanings, is the definition the parents construct from the stressful event. For example, when parents are told their child has Autism Spectrum Disorder (stressful event) each member of the family begins a process of constructing meanings as they interact with each other. During this process parents might also search for a cause, which often leads to self-blame (Patterson, 2002). Self- blame or feelings of worthlessness and failure not only increase stress levels, but affective symptoms (Hoppes & Harris, 1990). In addition to searching for a cause, parents also have to refine or develop expectations about who is responsible for managing the illness (Patterson, 2002). This procedure can also contribute to higher levels of stress experienced by family members. In short, the first level of the FAAR model can provide the foundation on how well parents, whose child is diagnosed with ASD, cope with the presented stressful event. The second level of the FAAR model is family identity and reflects how the family views itself. When a child is diagnosed with ASD, the parents have to change the family routine to accommodate the ongoing needs of the child. This includes changing roles, family routines and rules within the family structure. Ultimately this process can disrupt the family’s organisational structure, which may precipitate a crisis as parents may adapt to the situation differently or disagree on the family structural changes. This crisis can put a strain on the couple’s relationship that can lead to a family breakdown affecting the couple’s marital satisfaction (Patterson, 2002). Some researchers (Bluth, Roberson, Billen, & Sams, 2013; Brobst et al., 2009; Risdal & Singer, 2004; Santamaria, Cuzzocrea, Gugliandolo, & Larcan, 2012) have found that parents with ASD children report lower marital satisfaction compared to parents with typically developing children or children with other disabilities. Low marital satisfaction then contributes to parental stress as a strain develops between finding adequate time for the partner and child, as the child requires more support (Brobst et al., 2009). However, additional research has not confirmed these findings. For instance, Havens (2005) concluded that the challenges posed by an ASD diagnosis strengthened and enriched the couple’s relationship. It was further suggested that having a child with ASD only contributed to the relationship negatively if the relationships had existing problems (Taanila, Kokkonen, & Jäirvelin, 1996). These inconsistent findings could be attributed to the use of different methodologies.